Scndlines still has problems with the schedule on the Gedser-Rostock route due to ongoing repairs of the rudder gear of the "Kronprins Frederik" in Rostock. There remained a reduced schedule active with a capacity of only 50 percent. The sailings from Gedser at 09.00 a.m., 1.30 p.m. 5.45 p.m. and 10.15 p.m. and from Rostock at 11:15 a.m., 3:30 p.m. and 8:00 p.m. were cancelled at least until Oct 14. Scandlines recommended to use the Rødby-Puttgarden route instead. 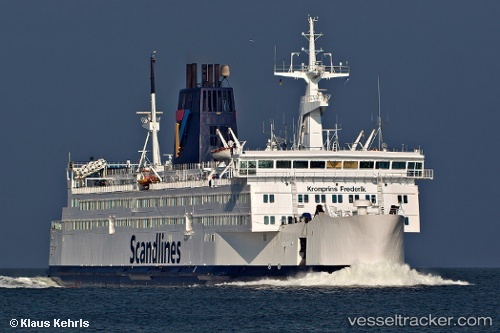 Two Scandlines ferries collided in Rostock on Saturday evening . Why it came to the accidential contact at a very low rate of speed between the "Kronprins Frederik" and the "Aurora" is not yet clear as the shipping company announced on Sunday in Rostock. Both ships were able to proceed on their own to their respective ferry terminal. After investigation and approval by the responsible authorities the "Kronprins Frederik 'could leave at 23.15 clock bound for the port of Gedser again.